Today I had a visit from Steve Vosloo, a Reuters Digital Vision fellow at Stanford. His project is called Digital Hero Book Project, based in Capetown, South Africa originally. Children were aided in writing a paper book with their own stories to help them cope with crises. The next step was to digitize the books and put them online. One Zambian writer's book cover is shown at the left. At Stanford, Vosloo is working with the Center for Digital Storytelling in Berkeley which does training in sophisticated media tools to make movies of people's stories. He is working with schools in the Western Cape and in India and the US, while looking at techniques where mobile phone cameras can be used to capture story material. We traded information about his projects and others that might be of interest to him such as Video Volunteers and OurMedia and discussed the upcoming iCommons conference in Croatia. Vosloo recently made a presentation before a foundation, a corporation, and a venture capitalist, all of whom gave him suggestions as he prepares to look for more support to continue the project at the end of his time with the Reuters program. We’ve come up with a wonderful way to allow people to share knowledge. We call it Yedda – a community knowledge sharing service, a place in which each and every question you ask is the single most important question in the world. And the world – or at least initially, Yedda members - will be invited to answer your question. We all have accumulated a lot of knowledge in that journey through life. Professional knowledge. Our hobbies. Stuff we built. Places we traveled to. Problems we solved. Things we bought. Things that interest us. We all have questions we need answers to. Introducing Yedda: matching people with questions and people with answers. You can sign up to take part. LionShare is an effort to set up a peer-to-peer file sharing environment for educational institutions (presumably not any K-12 schools).It is based at Penn State and is meant to enable students and faculty there and at other schools to share "legal" files. The member sharing will not be anonymous. People outside of Penn State must register to download the software which will be released to the public on September 30, 2005. Yesterday, IFTF hosted another FutureCommons meeting in Palo Alto. This is a monthly event where my brain begins to work at more than 1000 RPM. 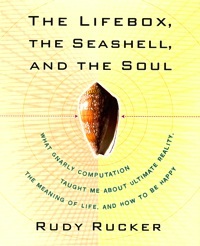 Rudy Rucker, former SJSU Math professor and author of many science fiction works, came to talk about his new book on cellular automata, The Lifebox, the Seashell, and the Soul , a book that weighs in at 1 Kg. and which I had an easier time grasping with my hand than with my brain. The bumper sticker might be: "Reality is made up of a lot of little computations." From his web site: " I spent twenty years in the dark Satanic mills of Silicon Valley. I'm covered in a thick lint of bytes and computer code. And now I'm stepping into the light to tell you what I learned among the machines." I had met Rucker at a Hacker's Conference 12 years ago. He and I are both from Louisville, Kentucky, and I remember his story about his early work teaching in a girls' school in Lynchburg, Virginia, where the dean cuationed him about his students, "There are two things you can't do. Don't screw them, and don't tell them there's no God." As Rucker said to me yesterday, "Well, I didn't do one of them." His talk in a way bridged the gap between intelligent design and evolution. Before he came to IFTF he pulled out part of his book for a paper with some interesting ideas: "history of gnarl" and his web sites will take you deeper into his writings and knowledge. I found myself in the position of someone who had heard of some of his references but knew nothing substantial about them. It was sort of like listening to a new form of music for the first time. He has synthesized a lot of reading and works of others which buttressed his ideas about the universe. He showed a number of open source programs that generated some of these computational patterns and life forms. Particularly striking were the scrolling patterns that resembled, among other things in nature, coral patterns and malachite, a semi-precious stone found near copper deposits. After he finished, there were surprisingly few questions initially, but Jerry Michalski led a discussion that was linked back to Rucker's talk. Jerry highlighted four or five books on 'the theory of everything' and asked who in the audience was familiar with each and could give a short summary. Last month Howard Rheingold started what might become a tradition, the five minute university--short introductions to topics and ideas, and that's what Jerry was hoping for. The ensuing discussion was a mix of personal reflection, how the books affected a particular reader, and ideas about other books. As a librarian, it was interesting to see how the discussion at the Institute for the Future was about books, though there were references continually to online resources, and Michalski frequently brought on screen his Brain (his web site leads to screen shots but the java applet did not seem to work) program that linked his own intellectual wanderings in a two dimensional space of ideas, people, wikipedia entries, and books. The Institute for the Future is a firm that produces forecasts and hosts workshops and meetings for its clients (membership varies by service but can be $65K per year) from industry and governments. They have been particularly strong in technology, emerging markets, consumer issues, and are expanding into global health trends. Besides the employees there are affiliate researchers, writers, and developers who take part in a program called GlobalCommons. It is an effort by IFTF to open up some of its activities to the public. Yesterday I attended a session in Palo Alto, after being invited by Howard Rheingold whom I had met on The Well almost twenty years ago. Howard is quite active in these monthly meetings as well as the Google Group for online interaction. There is also a Wiki which will serve as a repository of members' writings and personal profiles. After a half hour of meeting and talking around the open area at IFTF, Howard introduced us to the idea of the 5 minute university where he gave a short talk, handed out one sheet of paper with supporting information and URLs, and led a ten minute discussion. In subsequent meetings others will volunteer to do several sessions during the first hour. Howard spoke about an Economist article on the history and relevance of coffee houses in the development of political activism, stock exchanges, insurance industry, and even science. After that people added their own factoids about coffee or gathering places to consume other drugs (qat dens in Ethiopia and Yemen). I mentioned that in the Togolese village where I lived, the people who produced coffee and cacao never consumed it. -the end of cyberspace: will the metaphor work in the future? -modeling decision tools for small towns to plan their future. I attended the wireless discussion which was led by Anthony Townsend who wanted to craft a vision to guide the city officials of San Francisco who might look at this project as just a utility service like electricity and water. He hopes that the design will be open enough to allow for neighborhood experimentation. He and others are hoping that there will be an emphasis on the local information, ways to encourage local input, mapping, and the use of locative technology in mining existing information that pertains to San Francisco. A major benefit could be the development of "social capital." We talked about the hostility of the duopoly now providing Internet services: the telco and cable companies. I talked about some of the similar efforts during the dialup days of community networks and Free-Nets in Cleveland and Buffalo fifteen years ago and the problems of volunteer burn-out. The second open space was run by Anselm Hook a game designer who has become interested in what kind of tools could be used to model the variable factors that affect the future of a small town: environment, transportation, industry, housing. He likened to a super version of SimCity and mentioned the case of a researcher working with Bali rice farmers and used a computer simulation to show the positive effects of traditional water allotment patterns that were being disrupted by introduction of Green Revolution rice varieties. I mentioned Neighborhood Knowledge Los Angeles run by UCLA's Advanced Policy Institute. This was followed by a twenty minute wrap-up session that ended about 7 p.m. Some people stayed later and went to dinner to continue the conversations started during the sessions. In some fields full-time scientists and researchers are encouraging the public, i.e. dedicated amateurs, to contribute data that can add to the body of information and perhaps knowledge available in that field. Certainly, the Web has made that easier. Recently, I was alerted to the archive of nature sounds that originates in the Cornell Ornithology department. Besides providing some free bird sournds, they also license recordings for commercial use (in stuffed animals and perhaps even for the crow sound that alway accompany a shot of the nuclear power plant in the Simpsons cartoon. Here are a series of webcams trained on birds' nests around the country. This is of obvious use in schoolrooms, but one researcher, Michael Naimark, put webcams at African game park watering holes. The Cornell site also has some interesting information about citizen science. del.icio.us is a free web site for bookmarks you and others want to share. There is a tool for some browsers that will post any new bookmark to del.icio.us. In the world of professional indexers and catalogers there is a feature called an authority file which is a list of agreed upon categories or keywords. This one is different. On this site each user may add key word or tag to describe the link being saved. The most popular tags are listed at the right of the home page. If you want to do a search on a term, use "http://del.icio.us/tag/<word>" To search multiple terms, try this site. One of the problems is searching on a very general term such as "information." The results are too broad to be of use. There are tools to block and ignore certain terms or posters. This site was started by Joshua Schachter who also runs memepool. Eva Harris is a professor of public health at U.S. Berkeley and author of the book A Low-Cost Approach to PCR: Appropriate Transfer of Biomolecular Techniques. She had a conversation in 2001 about her own experience with technology transfer in Nicaragua some years ago. It adds a human face to this kind of knowledge sharing. For a number of years only professionals familiar with GIS systems like ArcInfo from ESRI were even talking about sharing geospatial information. With the commoditization of GPS receivers, cheap cameras, and some creative people writing code we how have a number of applications where citizens/consumers making ad hoc databases of photos, wireless hot spots, and other subjects. There are interesting humanitarian uses of mapping. Take a look at Global MapAid in Santa Clara, California. They are going to be mapping famine relief efforts in a part of Zimbabwe where Mugabe exercised extreme measures against the locals. On the lighter side, Picturesque Tokyo has a rather elegant interface.It will take a while to load. There is a b/w satellite image of the city, and each entry is a bullseye. Pass the mouse over and a small image comes up with latitude and longitude information as well as an altitude attribute--something crucial in a high rise urban area. In this 2002 speech at the Overseas Development Institute John Harriss critiques the concept of 'civil society' how it relates to Robert Putnam's ideas about social capital and how it de-politicizes engagement with those in power (See: The Anti-Politics Machine by James Ferguson).